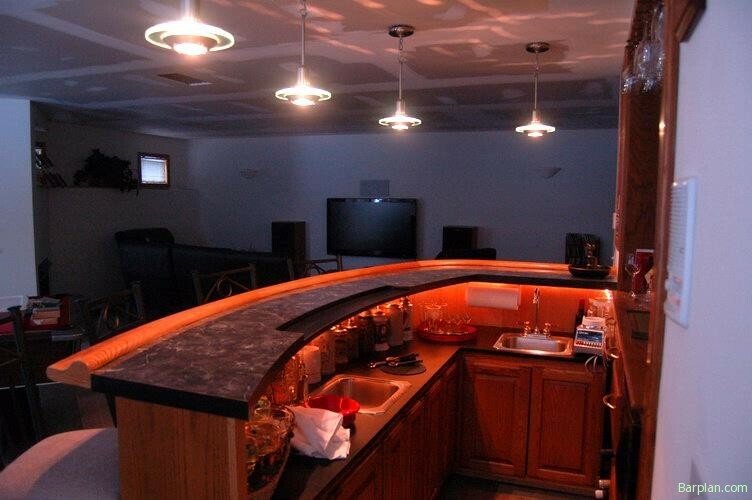 On occasion, our barplan.com members really impress us with their handiwork. This unique curved oak bar rail and bar was built by one of our more experienced and adventurous woodworking members. The curved seating arrangement allows his guests to see each other without having to suffer neck strain. It’s a great idea, but most importantly the final result is a beautiful bar that is sure to impress everyone. Although we try to keep our designs as simple as possible, we are currently working up several variations of curved and round bar designs. Anytime you start adding curves or in this case, designing the whole bar on a curve complexity is increased exponentially. From the base structure on up, all require special lumber preparation and cutting. Sheeting panels need to be added in thin flexible layers. Thicker sheeting materials require “kerf” cuts vertically to all the sheeting to bend around corners. layers. Machining cove cut curved arm rail requires advanced woodworking skills and equipment. We have an bonus project that shows you how to make curved bar arm rail using your own table saw. Be sure to bookmark the barplan.com website or sign up for our free newsletter to keep informed when new plans become available.